Retro Programming: CoreLife: Programming in 2 Dimensions! CoreLife: Programming in 2 Dimensions! For a while I've been promising to take a closer look at Dennis Luehring's list of programming games to select a few for further investigation. The list contains over 1500 links in 200 categories! The first I've chosen is CoreLife, a 2D variant of Corewar by Brent Adams. 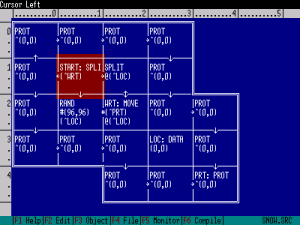 CoreLife is one of the earliest 2D programming languages, predating Befunge by a few months. Battles take place on a 100 × 100 memory grid. The outcome of a battle isn't uniquely determined by the initial conditions as there's a random element to the game. Unfortunately, there's very little information about CoreLife strategies. There are 13 published battle programs. Most of these launch imps or bomb the grid with protected locations. Battle programs are often surrounded by a membrane or shield of protected locations. Despite this CoreLife has the potential to support more complex programs, for example replicators. I've set myself the challenge of writing a replicator. First I'll attempt to write something linear and if that's successful, a square replicator! Has anyone experimented with CoreLife and if so, did you create a successful program or discover anything interesting? For more information about programming games, take a look at Steven Robbins' list of programming games or Dennis Luehring's list of programming games.